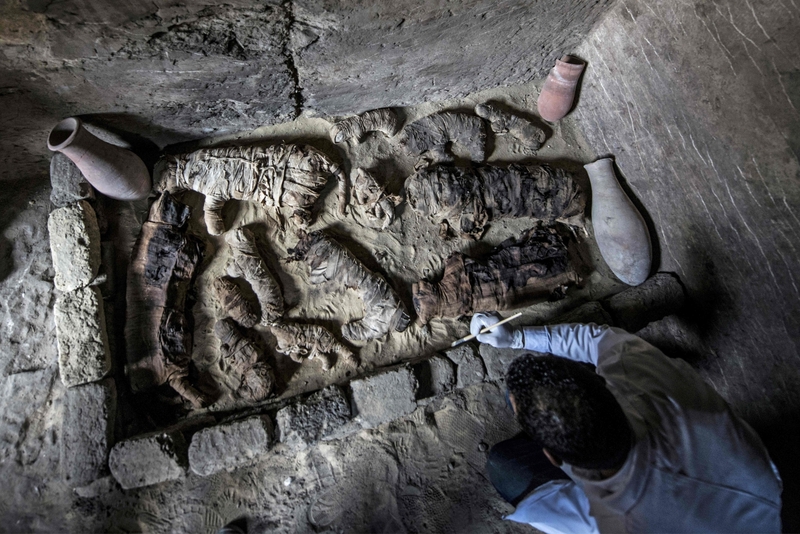 More than 200 mummies of cats and another 200-plus mummies of scarabs have been discovered in tombs at the King Userkaf pyramid complex in the necropolis of Saqqara. 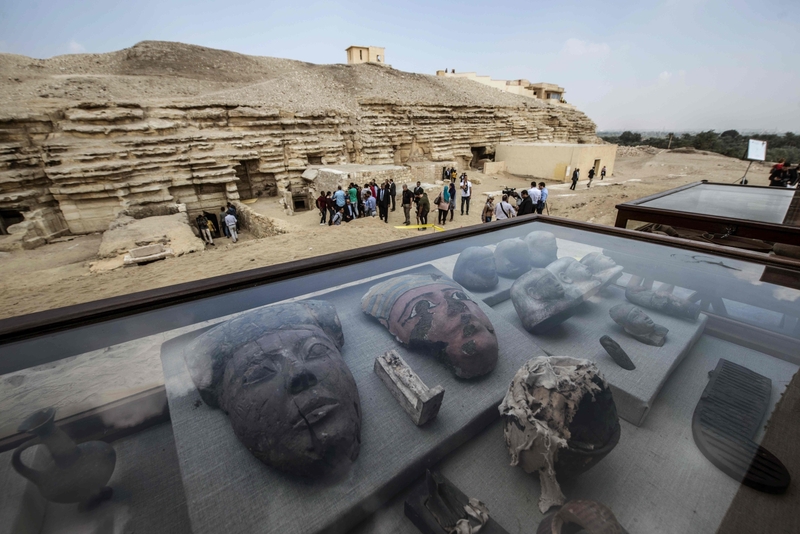 An Egyptian archaeological mission has been excavating the site at the stony edge of the pyramid since April of this year and has unearthed three New Kingdom and four Old Kingdom tombs. The New Kingdom tombs had been reused in the Late Period as a burial ground for the plethora of cats and scarabs and for several cobras and alligators as well. The eastern area of the site was previously excavated by a French archaeological mission and they too found Old and New Kingdom tombs with the latter having been recycled in the Late Period to inter cat mummies. That excavation project ended in 2008 and never reached the ramp area. The earlier discoveries spurred this year’s team. The prospect of discovering Old Kingdom tombs is what drew the team to excavate that area around the ramp of the Userkaf pyramid complex, as the location had a high probability of having been used during the Old Kingdom as a prestigious site for the tombs of important individuals. Indeed, the four tombs found belonged to elite people. Decorated stone reliefs and the remains of false doors were discovered in the tomb of Ankh Mahur, an Old Kingdom vizier. The names of two women were found carved on other false doors: Subek Sekt and Mafy. The most archaeologically significant of the four was the tomb of Khufu-Imhat, overseer of buildings in the royal palace. Khufu-Imhat’s tomb dates to the late Fifth Dynasty (2,500-2,350 B.C.). It is so important because it is still sealed, its false doors intact. The team do plan to open it in the future and hope to find undisturbed contents. 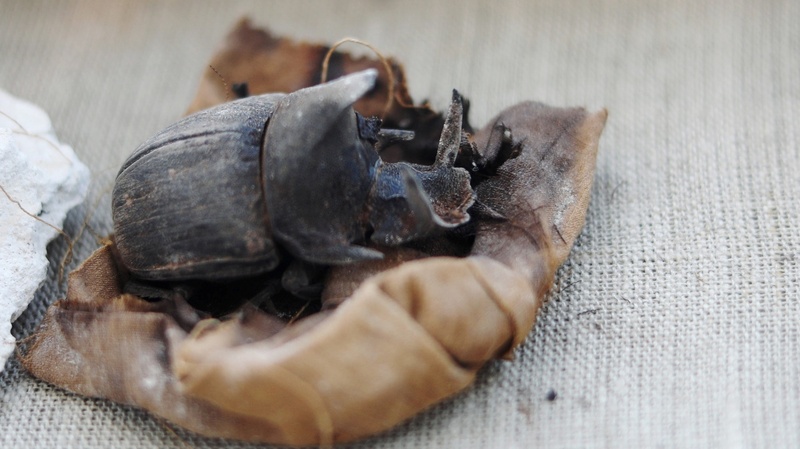 The scarab mummies in the New Kingdom tombs are the first to be discovered at Saqqara. Two large specimens were found inside a rectangular limestone sarcophagus with a vaulted lid. Three scarabs were painted in black on the lid. They were wrapped in linen and are in excellent condition. A second, smaller limestone sarcophagus decorated with a single scarab painted in black on the side was found to contain hundreds of scarab mummies. 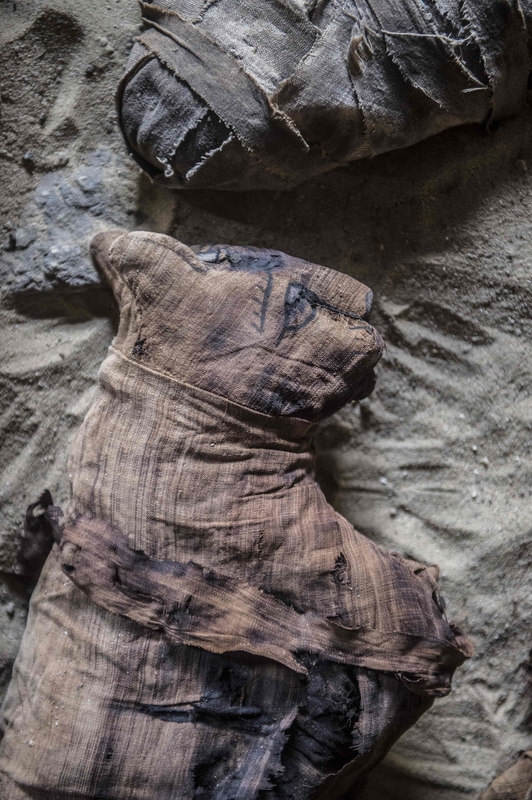 The cat mummies were linen-wrapped, some of them with surviving paint depicting the features of the cats. 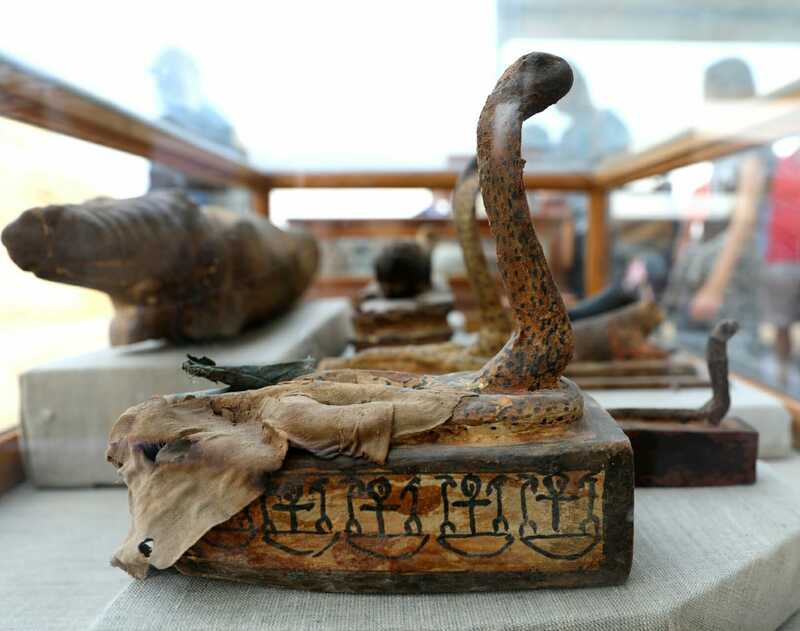 Small painted wood sarcophagi decorated with coiled cobras on the lid contained cobra mummies, and crocodile-shaped sarcophagi contained, you guessed it, crocodiles. 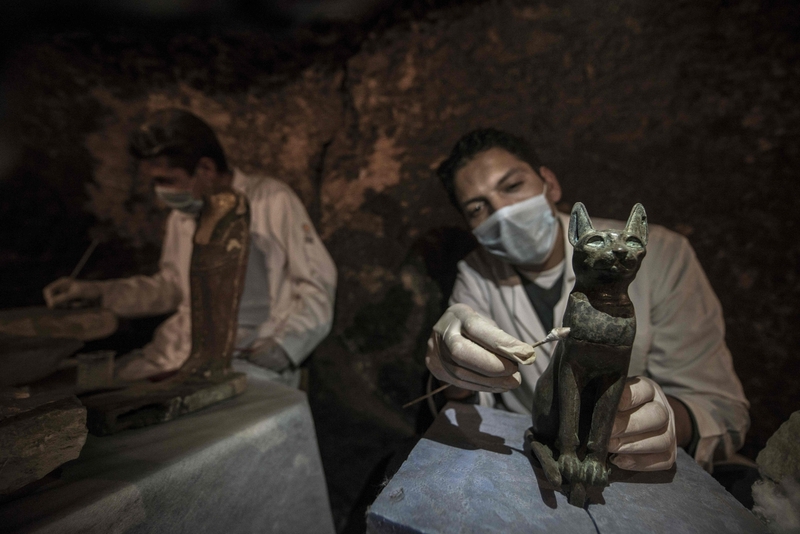 In the tombs with the animal mummies archaeologists also unearthed more than 100 gilded wood statues of cats and a bronze one of the cat goddess Bastet. Other gilded wood statues found include a lion, cow and a falcon. The tombs were filled with soil and debris. More than 12,000 cubic feet of soil had to be removed and sifted through. The mission painstakingly unearthed about 1,000 faience amulets depicting many of the deities in the traditional Egyptian pantheon — Horus, Isis, Anubis, the Apis bull — plus icons like the Udjat eye, the white and red crowns of Upper and Lower Egypt, and the Wadjat column. Also found in the fill were three alabaster canopic jars, ink pots, pens and papyri written in Demotic and Heretic. Other archaeological treasures include a collection of papyrus baskets and ropes in exceptional condition, 30 clay pots and, inside a wood sarcophagus, an alabaster head rest and bronze jars. This entry was posted on Sunday, November 11th, 2018 at 11:02 PM	and is filed under Ancient. You can follow any responses to this entry through the RSS 2.0 feed. You can skip to the end and leave a response. Pinging is currently not allowed. 1000 amulets is a lot! That collection would make a pretty cool photo.